DINESH AGARWAL, founder & CEO of IndiaMART.com, is credited with leading the online b2b marketplace profitably through the crisis periods of dotcom bust, 9/11 and Lehman collapse. Prior to starting the postal in 1996, this computer engineer from HBTI Kanpur had stints in HCL Technologies (US), CDoT and CMC India. An early bird in the online retail space, Agarwal has over 20 years experience in the fields of Internet, networking & systems development and consulting. He had an online interaction with SME World recently. Tell us about the growth of IndiaMART, and the critical factors/events that helped in its growth? The 17 year-old company is India’s largest online B2B marketplace for small and medium enterprises (SMEs), offering a platform and tools to over 1.2 million suppliers to generate business leads from over 6.5 million buyers. However, the beginning wasn’t this rosy. When IndiaMART.com was founded in 1996, there were only 500 subscribers of internet. 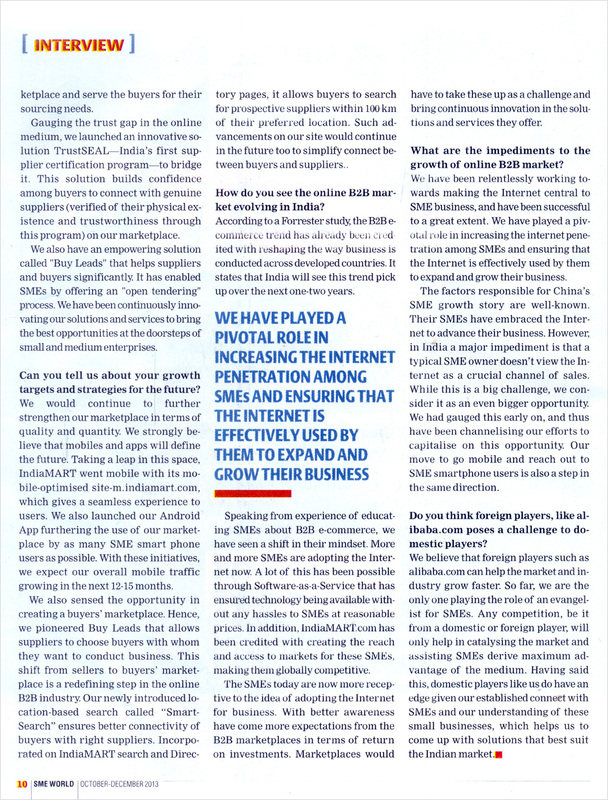 The big task at hand was creating immense awareness about the existence of internet and its benefits to business. Over the years, with regular outreach, hand-holding of SMEs and enrichment of its services, IndiaMART created a leadership position for itself such that today it enables Rs 10000 crore worth of B2B sales annually for its members. It also holds the feat of being the only profitable company during the dotcom bust. In fact, more that dotcom boom, the dotcom bust proved to be a golden period for us. The B2B marketplace today hosts over 50 lac products across 1 lac categories, and gets 4.6 crore page views, 85 lac visitors and facilitates 10 lac tracked business inquiries per month. How do you know that you’re connecting the right people/firms? What are the safeguards you take to protect the buyer and seller? Our 1500 internet consultants operating out of 50 offices spread across 21 cities and serving 100 towns reach out to suppliers and meet them before they are taken on board. This acts as the first verification filter that ensures the selection of right profiles of suppliers who are equipped enough to be on our marketplace and serve the buyers for their sourcing needs. Gauging the trust gap in the online medium, we launched an innovative solution TrustSEAL – India’s first supplier certification program – to bridge it. This solution builds confidence among buyers to connect with genuine suppliers (verified of their physical existence and trustworthiness through this program) on our marketplace. We also have an empowering solution called “Buy Leads” that helps suppliers and buyers significantly. It has enabled SMEs by offering an “open tendering” process. We have been continuously innovating our solutions and services to bring the best opportunities to the doorsteps of small and medium enterprises. Can you tell us about your growth targets and strategies for the future? We would continue to further strengthen our marketplace in terms of quality and quantity. We strongly believe that mobile and apps will define the future. Taking a leap in this space, IndiaMART went mobile with its mobile-optimised site m.indiamart.com which gives a seamless experience to users. We also launched our Android App furthering the use of our marketplace by as many SME smart phone users as possible. With these initiatives, we expect our overall mobile traffic growing in the next 12-15 months. We also sensed the opportunity in creating a buyers’ marketplace. Hence, we pioneered Buy Leads that allows suppliers to choose buyers with whom they want to conduct business. This shift from sellers to buyers’ marketplace is a redefining step in the online B2B industry. Our newly introduced location-based search called “Smart Search” ensures better connectivity of buyers with right suppliers. Incorporated in IndiaMART search and Directory pages, it allows buyers to search for prospective suppliers within 100 km of their preferred location. Such advancements on our site would continue in the future too to simplify connect between buyers and suppliers. How do you see the online B2B market evolving in India? According to a Forrester study, the B2B e-commerce trend has already been credited with reshaping the way business is conducted across developed countries. It states that India will see this trend pick up over the next one-two years. Speaking from experience of educating SMEs about B2B e-commerce, we have seen a shift in their mindset. More and more SMEs are adopting the Internet now. A lot of this has been possible through Software-as-a-Service that has ensured technology being available without any hassles to SMEs at reasonable price. In addition, IndiaMART.com has been credited with creating the reach and access to markets for these SMEs, making them globally competitive. The SMEs are now more receptive to the idea of adopting the Internet for business. With better awareness have come more expectations from the B2B marketplaces in terms of return on investments. Marketplaces would have to take these up as a challenge and bring continuous innovation in the solutions and services they offer. What are the impediments to the growth of online B2B market? 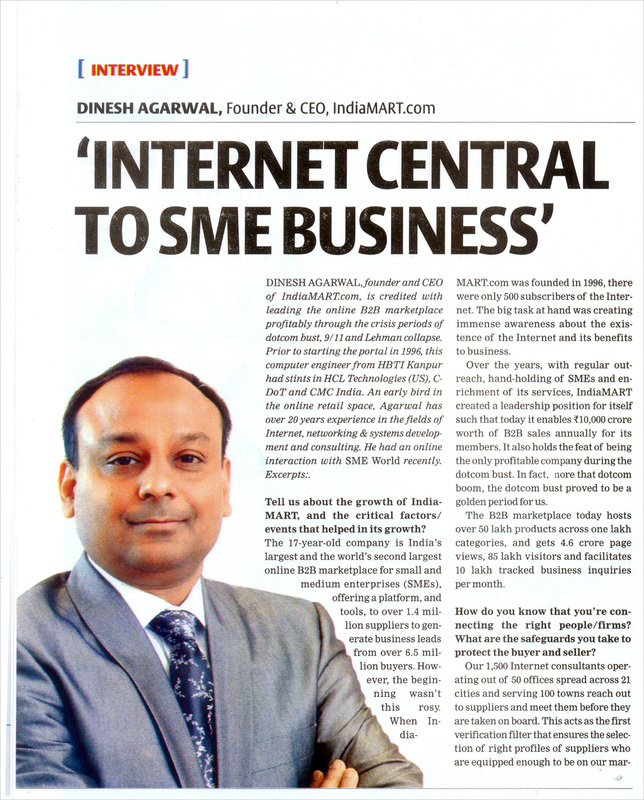 We have been relentlessly working towards making internet central to SME business, and have been successful to a great extent. We have played a pivotal role in increasing internet penetration among SMEs and ensuring that internet is effectively used by them to expand and grow their business. The factors responsible for China’s SME growth story are well-known. Their SMEs have embraced the Internet to advance their business. However, in India, a major impediment is that a typical SME owner doesn’t view the Internet as a crucial channel of sales. While this is a big challenge, we consider this as even bigger opportunity. We had gauged this early on, and thus have been channelizing our efforts to capitalize on this opportunity. Our recent move to go mobile and reach out to SME smart phone users is also a step in the same direction. Do you think foreign players, like alibaba.com, poses a challenge to domestic players? We believe that foreign players such as alibaba.com can help the market and industry grow faster. So far, we are the only one playing the role of an evangelist for SMEs. Any competition, be it from a domestic or foreign player, will only help in catalysing the market and assisting SMEs derive maximum advantage of the medium. Having said this, domestic players like us do have an edge given our established connect with SMEs and our understanding of these small businesses, which helps us to come up with solutions that best suit the Indian market.